WHY SHOULD I USE A BUSINESS BROKER / INTERMEDIARY? Anyone who has ever attempted to buy or sell a business on their own can tell you that it can be a long, tedious and often frustrating process. For the Seller, the procedure consumes an inordinate amount of time and diverts attention from the daily operation of the business. When the focus should be on maintaining, or preferably increasing the value of the business, all of the owner’s time and effort is devoted to the sale process. For the Buyer, the access to quality opportunities can be very limited. The financial data required for proper due diligence can be vague and in some cases, nonexistent. The asking price for the business, as most often determined by the Seller, may be questionable and the inexperienced Buyer generally lacks the tools and resources necessary to arrange for adequate financing. Whether you call them a Business Broker, Business Intermediary, M & A Specialist, Investment Banker or Business Transfer Specialist, using the services of an experienced representative will make all the difference between closing a deal and losing a deal. At Business Intermediary Group, we are skilled professionals in the Business Brokerage and Mergers & Acquisitions arena. Due to our longstanding success in the Capital Region marketplace, we are acutely aware of the current level of supply and demand for quality business opportunities. No other professional is in that position. We have also established a good working relationship with the many ancillary organizations whose services are required to complete the successful sale of a business. These relationships will prove to be invaluable to both business owners and their potential buyers. Our ultimate goal at Business Intermediary Group, for both Buyer and Seller, is to streamline the process; reducing the overall time and expense involved, while maximizing the potential benefits for both parties. We will identify qualified prospects, negotiate the purchase and keep the whole matter confidential until the deal is closed. • A preliminary analysis and professional valuation of the opportunity, to determine a fair market value and offering price. • Preparation of a comprehensive digital marketing package to present to qualified buyers and their professional advisors. • Pre-screening of potential purchasers to determine appropriate background experience and financial capabilities. • Negotiating the structure of the purchase so that both of the parties involved in the transaction obtain maximum benefit. • Arranging for the transfer of licenses, leases, contracts, agreements and other closing documents to assure a successful and stress free exchange of the business. • Provide a clear understanding and a step by step detail of the business buying process. 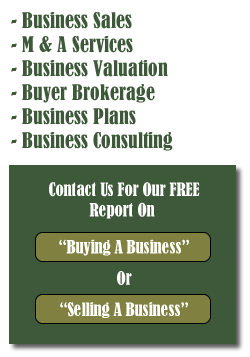 • Assist in matching the purchaser’s needs, desires, interests and goals with the most appropriate business opportunity. • Develop a business/financing plan for presentation to selected Lenders, if required, to assist in securing the necessary commercial financing. • Support the transition into the new business before, during and after the sale. Whether you are a seasoned corporate investor, seeking an acquisition that would provide some synergy to your existing company; or an individual buyer who has specific criteria for that perfect business to purchase, our Buyer-side representation services can save you time, money and frustration. By utilizing a country-wide company database and using your unique acquisition criteria, we can find the perfect opportunity that fits your specific needs. Service rates are generally negotiated on a case-by-case basis and may involve either a retainer, hourly consultation fees or a success fee at closing. An accurate valuation is critical because it will document and justify the fair market value of the business; determine the maximum amount and types of financing it can support and examine the best options for the owner. When our analysis is complete, you will know exactly how much the business is worth and why and we can illustrate how a proposed sale would take place in the open market. Valuing a business is as much an art as it is a science…and it is a complex and painstaking process. Having a good working knowledge of the business-for-sale market is a key advantage in valuing and pricing a business. For more information, please contact us today to arrange for a no-obligation consultation, to help you get started. If you’re already a client and you have enjoyed working with us, we hope you’ll refer a friend, colleague or family member who may benefit from our services. © 2019 Business Intermediary Group LLC. All Rights Reserved.